Global PC sales reached 67.2 million units in the third quarter of this year, marking a 0.5 percent decrease over the same period last year, according to a new report from International Data Corp. (IDC). The slight reduction is better than the 1.4-percent drop IDC previously projected and represents a wider trend of market stabilization, according to the company. Closer to home, the traditional PC market (which includes notebooks, desktops and workstations) in the United States saw shipments of 16.6 million units, with notebook sales dropping noticeably and desktops outperforming forecasts. "The U.S. traditional PC market exhibited lower overall growth, contracting 3.4 percent in 3Q17," said Neha Mahajan, senior research analyst for devices & displays, in a prepared statement. "Despite the overall contraction, Chromebooks remain a source of optimism as the category gains momentum in sectors outside education, especially in retail and financial services." Other mature and emerging markets also struggled, with the exceptions of Japan, Canada and Latin America. HP led the market, with 15.3 million shipments and a 22.8 percent market share. Those numbers are up from 14.4 million shipments and 21.4 percent of the market during the same period last year. 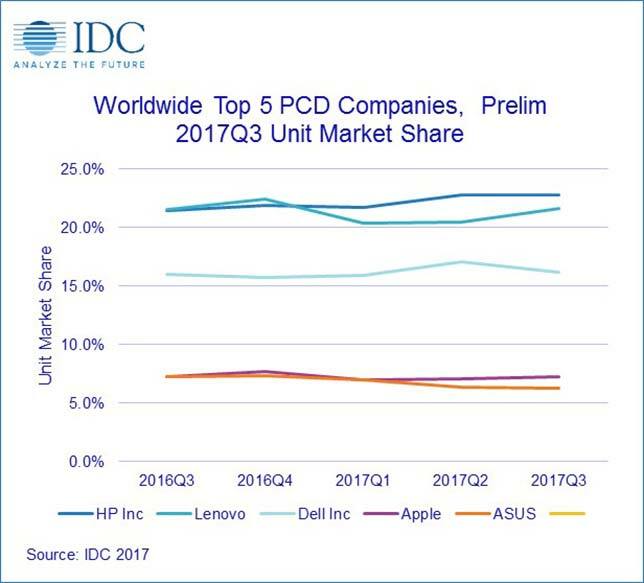 "HP was the only top vendor to manage a notable shipment increase with growth of 6 percent on the year," according to information released by IDC. In second place, Lenovo moved 14.5 million machines to capture 21.6 percent of the market in 2017's third quarter, marking a year-over-year improvement of .1 percent. Lenovo "continued to struggle in North America," according to a news release, "with weak notebook sales, but also seemed to have slowed its recent decline in Asia/Pacific." Dell sold 10.8 million units in the most recent quarter, improving its market share to 16.1 percent from 15.6 percent during last year's third quarter. Apple held the fourth spot with 4.9 million sales and a 7.3 percent share, a slight improvement on the 7.2 percent share it held for the third quarter of last year. Asus was the only company in the top five to see a decline faster than market average. The company sold 4.2 million units during this year's third quarter for 6.2 percent of the market. During the same period last year, the company shipped 4.9 million units and accounted for 7.3 percent of the market. "The traditional PC market performed much as expected in the third quarter," said Loren Loverde, program vice president for worldwide PCD trackers, in a prepared statement. "Emerging markets rebounded slightly more than anticipated, but overall results reflect the stabilization we expected following component and inventory adjustments. The outlook for the fourth quarter remains cautious, likely with a small decline in volume for the quarter and the year. The gains in emerging regions and potential for more commercial replacements represent some upside potential, although we continue to expect incremental declines in total shipments for the next few years."